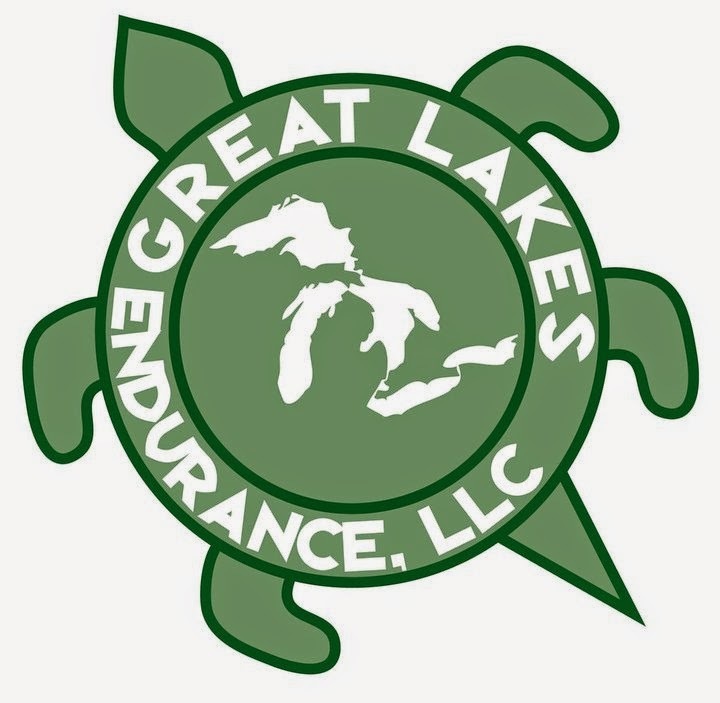 This post is specifically for the Southeast Michigan Runners Group that are running the SEMR Beer Run 5k on January 21st. I also want to thank Red Fox English Pub in Royal Oak for allowing us to have our event at their location. Below is a summary of all the prizes available for this run and I want to personally thank all the sponsors for their generous donations to make the Beer Run a great event for the group. Buff - Three to give away(I have yet to receive these in the mail but they are in route and hope to have them for the run but the picture below is of two that I have). For those that have not tried a Buff before, you are in for a real treat. These are lifesavers all year long while training. I did a review on these in the past that you can read HERE. I have four of them myself and they are invaluable. It's one of those essential items you need for running and is especially useful during cold weather running. 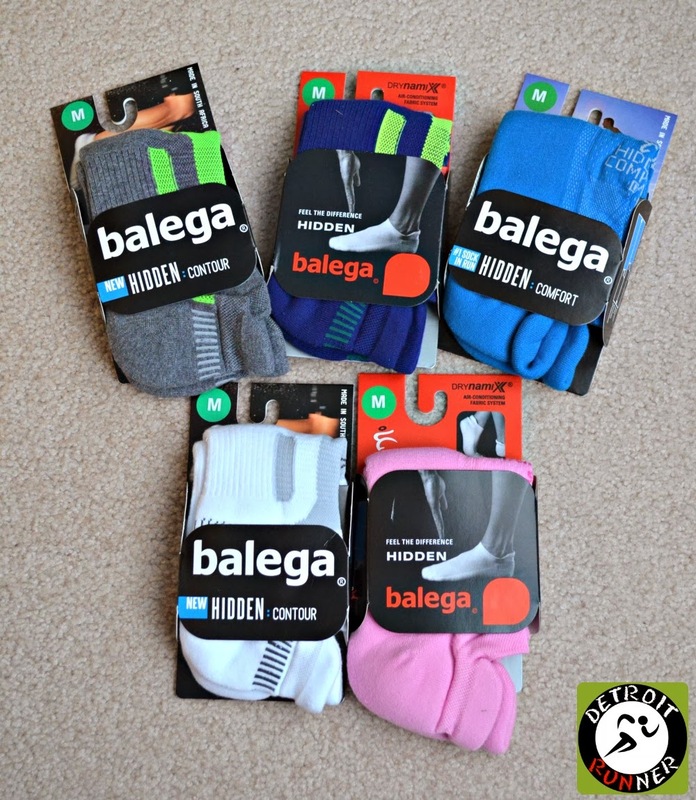 Balega Socks - five pairs to give away. I've also reviewed a couple different pair of Balega socks that you can read about HERE and HERE. 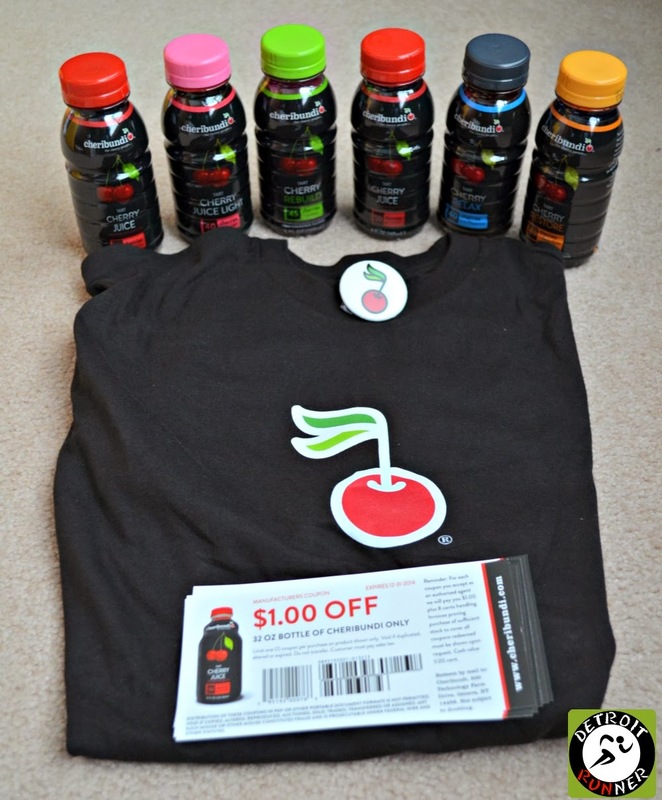 We have a great variety to give away that is sure to be a staple in your running clothes. Kona Race Entry - Kona Running Company was generous enough to give a free entry to the Kona St. Patrick's day race coming up on March 16(10k, 5k or 1 mile option only). As most of you local runners know, Kona puts on a great race and their race management has been excellent over the years. You can read my last race review HERE. 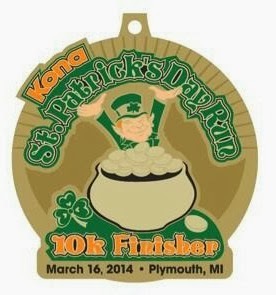 Here's the medal if you decide to run the 10k. Awesome bling! Velopress books - Velopress was very generous and is giving away three of their new books. Quick Strength for Runners, the runner's guide to Yoga and Racing Weight Cookbook. I personally have all three of these on my list to purchase with all three books geared towards runners. All look excellent(I've looked through them) and I'm a big believer in cross training for runners. I've also read many of their other books and they put out some exciting information for runners and other athletes. I also listed the Rock N Roll guide to Marathon and Half-marathon training. I reviewed this book previously and thought I would also give that away. You can read my review HERE. It's a great plan for beginners especially. 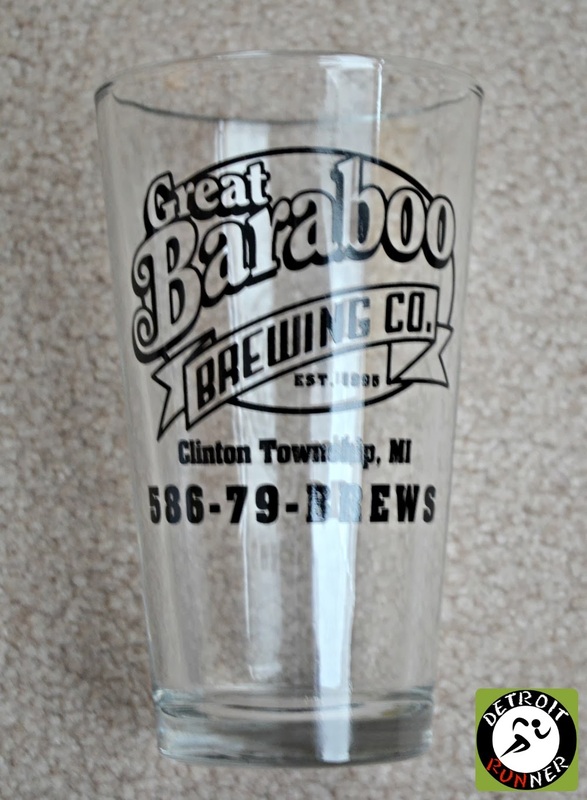 Detroit Runner donations - I personally picked up a couple beer glasses for the event. I didn't think it would be appropriate to not give away at least something related to beer! Haha! Goat Head Gear - Solespikes - three sets to give away. I've run in Goat Head Gear Sole Spikes for the last couple seasons and they are great for winter running. You can check out my previous review HERE. If you want to run all winter long outside, these are the things to have. They grab ice and keep you stable. 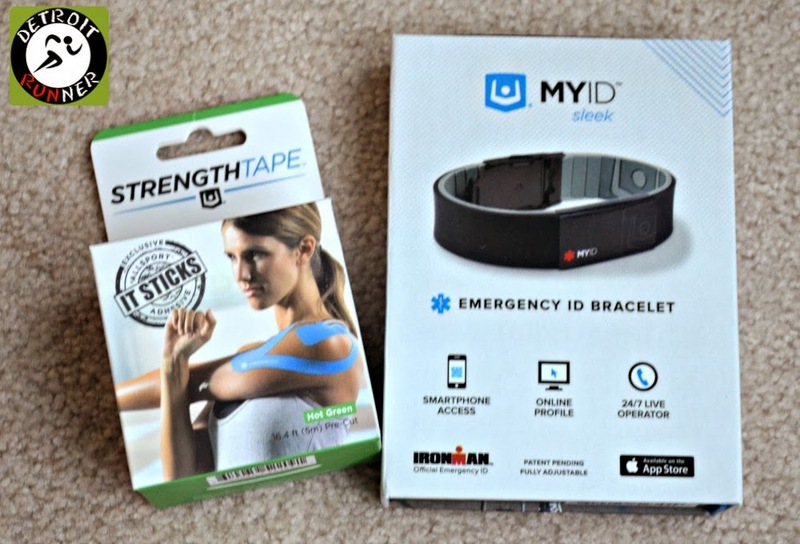 EnDevr - Strength Tape and MyID Sleek - While I have not had the opportunity to try the Strength Tape just yet(thankfully I have not been injured), it looks like a great product to help keep you running without further injury. I have tried the MyID Sleek and did a review on it HERE. As you know, I'm a huge believer in safety while running and Emergency ID is 100% imperative. This is a great option for any athlete. RooSport - They will be giving away two of their products. This is a cool little pocket that you can put on the inside of your pant or short to carry money, keys, etc. 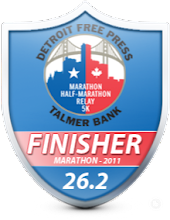 It's especially great for a passport for those that are running the Detroit Marathon or International Half this year. I also love using this when I do 5k's since I don't typically take anything with me for that race distance so it gives me a place for my stuff. You can read my full review HERE. Running Fit - Hightail to Ale Race Entry! This is going to be one fun event. I'm already signed up for it and the swag is awesome! A beer run race entry at a beer run. Yes, please! This one takes place in Detroit starting at Atwater Brewery. How awesome is that? Personally, I think this is a "must do" race for this year. Running Fit will be there to give away their entry. This is part of their Thirsty Three race series which I also happen to be signed up for as well. Road ID - Not only is Road ID providing 100 bibs for the run, they also provided six $15 gift certificates towards a road ID on their website. Once again, safety must be a priority for all runners. 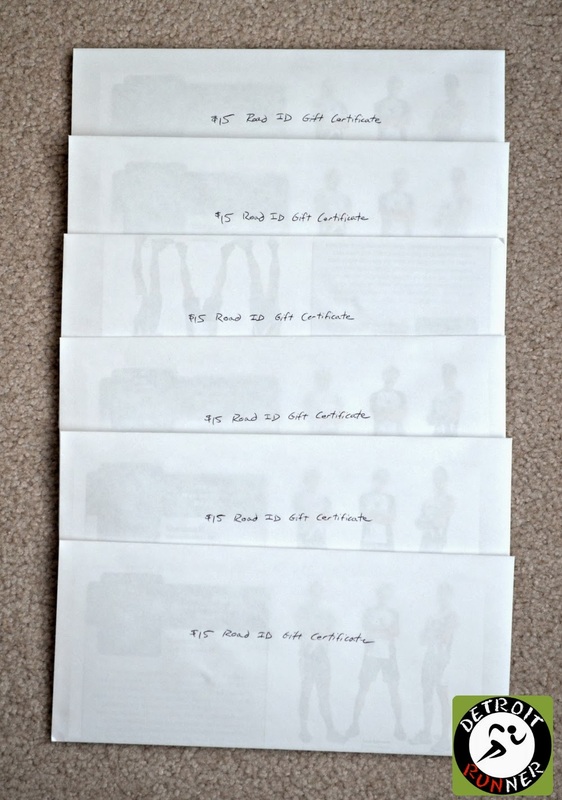 Road ID was very generous to provide these and there will be six lucky winners. Armpocket -Armpocket provided two of their products including the Sport i-20 and the Aero i-10. I've used their Sport i-20 for almost a couple years and it's great to hold your phone. You can read my full review HERE. Actually both are great for that! You can also fit money, credit card and keys in there. It's a well made product. 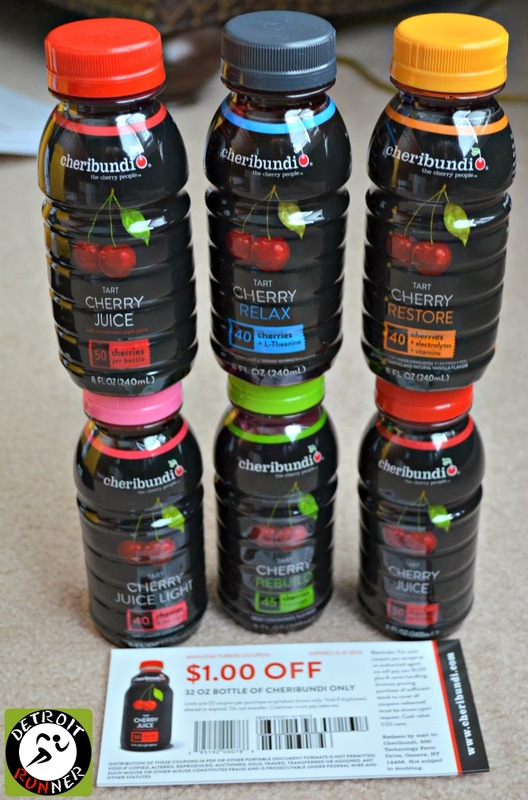 Cheribundi Juice - Cheribundi is giving away twelve of their Cherry drinks as well as a shirt and some coupons. I decided to break up the packet so that two luck winners get to sample their products. I was pleasantly surprised with this when I reviewed this product. A great drink for runners. You can read my full review HERE. The Cherry Restore is still my favorite! RUNdetroit - Justin and Alia over at RUNdetroit has offered two race Entries to Rock CF Rivers Half Marathon and 5k. I've run the race a couple times and it's an incredible race and very popular. You can read my last race review HERE about the 2013 race. Emily, the race director, does an outstanding job. RUNdetroit will be sponsoring the 5k this year. You can choose to run either the half marathon or the 5k race. RUNdetroit will be there to give away their entry and may even have some other items. What an incredible prize!!! NoxGear Tracer 360 lighted Vest - I received this lighted vest in October for a review(HERE) and I've been running with it ever since. 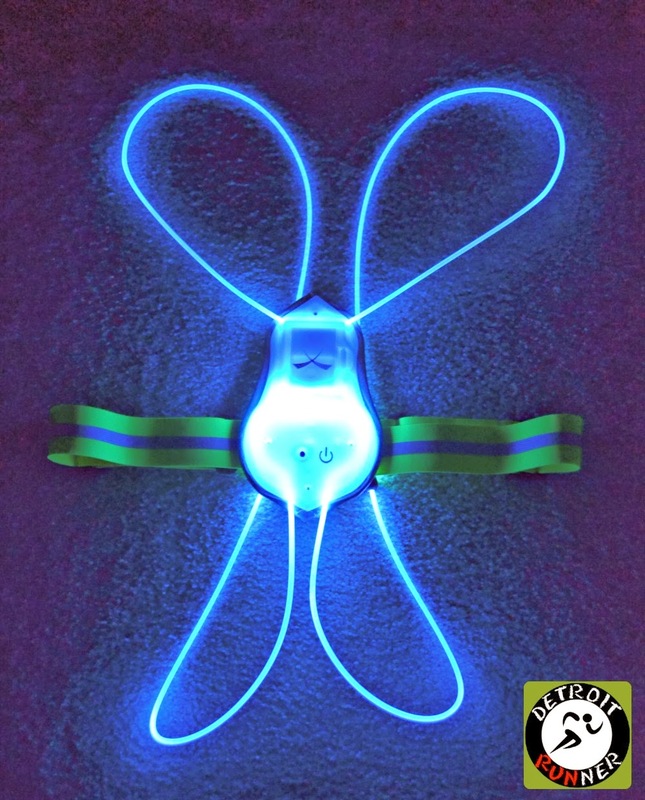 This thing is so bright and different from your typical reflective gear. It's a great product for those running in the dark as cars see you from afar. I've used it in 80 degree weather and -35 degree wind chill and it performs great. A really great product! I'll have mine on at the run so you won't miss me! Outside PR - Last but not least, Outside PR was very generous to offer up several items from the various clients they have related to running. Thanks certainly goes out to them as well as Injinji, Pearl Izumi, GU Energy, Strava and Road ID - They have supplied 10 pair of Injinji socks - yes 10 pairs!!! !, a Pearl Izumi tech shirt, GU/chomps energy, Strava bottles, and a certificate for a Road ID Sport. I've reviewed several Injinji socks HERE and HERE and have purchased numerous pairs. They are awesome socks to wear! I have worn a Pearl Izumi winter jacket(review HERE) for the last couple season and love their clothing. In fact, I have a pair of their trail shoes coming in the mail shortly as well. I have used GU in the past and Salted Caramel is my favorites flavor although the Chomps are a better consistency for me. I have used and reviewed Strava(HERE) and just recently put 100% of my runs into their website - over 5,000 miles! For a free site, it's the best that I've seen for tracking your activity. 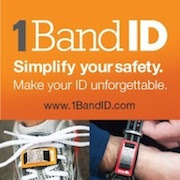 Of course, I've used Road ID(review HERE) in the past since I first started running - just make sure you have ID on you! GU - split for five prizes! The Beer Run should be a really fun event. That's 55 prizes to give away in all! Wow!!!!! For those of you that cannot attend, I'll be back with a post about the actual event after it's over. Once again, thank you to all the generous donations by all the sponsors. By the way, if after all that, you don't win something. Well, at least you'll have a medal(paper) to take home with you for the memory of joining us at the Beer Run! Note: I received some of these products for prize giveaways for the event in exchange for a blog post. All opinions are my own and I was not required to post a particular opinion on a product. Wow, I have no idea how you managed to get so many donations! That is awesome! What a fun event and great giveaways....too bad I don't live closer! I'm really bummed that it's on a weeknight and I work late. :( If there's another group run like this can we do it on a weekend?? I'm excited to see how it all works out! Have fun! Gotta get one of those medals!!!!! So I fly over... No I'll run on the mountain... and drink wine all evening!! !